Looking back on this wedding like, wow. A beautiful, fun, new venue for me and also, this couple just ruled. I'm going with probably venue of the year award. Look at this place! Crew boats in the ceiling, what?! They had a gorgeous ceremony right on site, including some famous Bob Dylan lyrics and all. First dance? Don't worry, Katie & Sean had everybody covered. From their Harlem Shake intro, to Into The Mystic by Van Morrison, then Sean throwing his jacket off and the two busting out a choreographed routine to Uptown Funk, right back into the mystic... Everyone was losing it! With the vibes set to early classics from The Beatles, Rod Stewart, Earth Wind & Fire, some fun Country, I couldn't wait to get into dancing. Katie & Sean's musical tastes were mirroring mine so well and I got to throw in some bangers from Cash Cash to Zedd.. This rarely happens and the place was literally bouncing off the walls... So fun. Huge shout out to my friend and bridesmaid Lindsay for bringing all this together. I recently met her through picking up a massive event for Umass Amherst this year. "Is this going to make the blog!?" - she says.. haha Hey Lindsay! Boston Waterfront / Trade Wedding! Big congrats to Jordan & Geoff on their awesome Boston wedding day. We had the ceremony right on Rowe's Wharf at the Foster's Pavilion. Such a beautiful spot! From here we transitioned over to Trade right on Atlantic Avenue for the rest of the evening. Raw bar for cocktail hour, a fantastic dinner menu, right into an epic dance party with, yep, an amazing bar staff pulling off flaming cocktails and all. It was really cool to switch it up with a venue like this. We took over the entire restaurant. Big ups to my dear friend Alexis and her team over at It's The Little Things for handling all the event planning! Meeting Chad from First Mate Photo was a treat! Swear we've worked together somewhere before man.. Can't wait to see photos of the day! The vibes all night were so perfect. Such a nice intimate setting for dinner and the toasts / speeches. Music ranging from Lovin' Spoonful, Van Morrison, to Young-Holt Unlimited. It was great. SO many friends & family from all over the continent were in attendance for these two. Thanks so much for having me be a part of your special day guys. I'll never forget that sing-along to "I Wanna Dance w/ Somebody". The entire staff involved too.. Man.. I hope the epic Karaoke after-party was just as fun! This was one for the books! 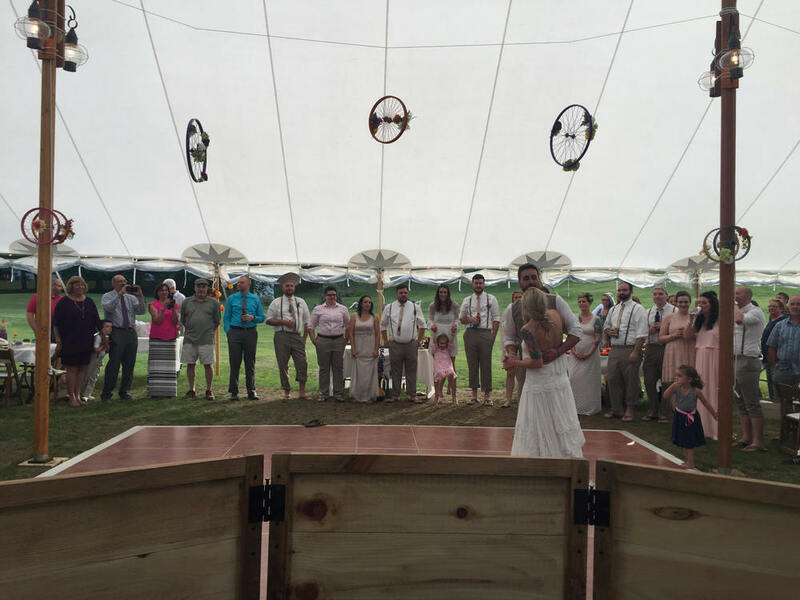 Jaime & Chris's Orchard BBQ Wedding! I was looking forward to this wedding all year. Great friends and also a great location! Jaime & Chris's wedding was at Hyland Orchard located behind the Rapscallion Brewery out in Sturbridge, MA. They had their ceremony off into the fields and it couldn't have been more beautiful. Hearing their vows to each other provided the meaning of how much these two were meant for one another! So wonderful. The Custom Booth fitting right in! Side note : Best man's Dad help develop the Bose Sound System I use. Smallest world. Providing the catering deliciousness was none other than BT'S Smokehouse. It was awesome to work with these local favorites! Jaime's sisters had a very special toast prepared for the bride and groom. They had a "wedding survival kit" full of numerous products and gifts to help with everything from a zombie apocalypse, to a mix cd for the honeymoon. When mentioning the wonderful mix, I cue'd in Jamie's favorite tracks ranging from Boyz II Men, N'SYNC, to Usher. It was a treat. Even pulling up the theme song to Chris's favorite movie, Jurassic Park. Thanks for having me be a part of that epic speech ladies! That was a first for me. Couldn't have asked for a better day, an even better night. Dance floor packed til the very end! Such a pleasure being there for you guys! Cannot wait to see the footage from my pals over at Just Fly Casual. I saw some sneaks and it looked absolutely unreal! Congrats guys! Lauren & Conor's Backyard Wedding! This was one for the books! We celebrated Lauren and Conor's beautiful day at a private residence up in New Hampshire that was just the best location for their wedding. The rain held out! We made the ceremony happen outdoors and it couldn't have been more perfect. Conor and Lauren's choice of ceremony music included The Avett Brother's "January Wedding" as well as Talking Heads "This Must Be The Place". The day was catered by the fabulous people over at the mobile wood fired pizza truck Posto Mobile (so so delicious) and the photography was captured by the wonderful Emily Tebbetts! All photos in the blog are by her! Too good to not use! Thanks Emily! Some highlights from the evening would definitely include the powerful 5 man "best man" speech. Great stories told by some of Conor's best guys. Also, getting into great hits ranging from Phil Collins to Lauren's favorite, Pitbull, huge sing-a-longs to Taking Back Sunday, just made the night so awesome. Even losing my keys at the end of the night for a bit was fun! Ended up being in my bag the entire time. I think I was just lost in how rad this wedding was. Thanks for having me guys. Congrats to you! Becky & TJ's Campground Getaway! Such. Good. Vibes! This wedding was unreal. Complete takeover of Anchorage at the Lake in beautiful Tilton, NH. They had the whole campgrounds to themselves and their guests. The ceremony was absolutely stunning. Completely designed and put together diy. These two and their families did such an amazing job with every detail involved. Just wow. Wonderful to see many close friends here as well! Complimenting the vibes all around meant the style of music. Becky walking down the aisle to "I Want to Hold Your Hold" by T.V. Carpio was a moment.. They also exited with "Home" by Edward Sharpe & The Magentic Zeros. A personal fav of mine. Opening up the reception introductions with "Little Secrets" by Passion Pit?! Yes please. Sticking with indie and folky feels through cocktail and dinner, we got right into dancing while the sun was still shining off the lake. It was a total 80's dance party to say the least! I couldn't stop playing.. So we kept it going as long as we could! Thank you so much for having me guys! I honestly had one of the greatest times. Staying the night on a beach, with a bonfire, topped with delicious cupcakes was also a treat! Your family and friends are terrific. Congrats! Make sure to head over to my Pinterest page to see more detailed creativity from this amazing wedding as well as others! Eliza & Mitchel's QuonQuont Farm Wedding! It was great to be back at QuonQuont Farm in Whately, Massachusetts! Eliza & Mitchel's ceremony was covered by family musicians and they also performed the first dance. Working with musicians is a big deal being one myself! I offered to provide the extra set up for them knowing it would be very reliable and professional sounding. They were stoked! This is such a special moment and it sounded amazing. Ray and Wayne performed “Someone to You” by Andy Gullahorn. Congrats you guys! Wish you the best and thanks so much for having me! Below are some sneaks from a new friend Svitlana Pimenov! Great meeting you! My custom made DJ booth! With the season approaching, I figured I'd show off a little bit of what I designed and built towards the tail end of last season. I had a vision for this, more rustic vibes than your traditional booths or tables, and put myself to work. It looks great in pretty much every style venue (indoors and out) while matching with the dance floor, walls, ceilings, you name it. Brides, grooms, and guests have been loving it! Check out the photos below! Interview with Alexis of It's The Little Things Event Planning! Ever wonder what goes on with wedding dj costs? Alexis is a wedding / event planner and she asked me to answer some questions for insight on the topic. Thanks Alexis! Click the photo to head over to The Little Things site!